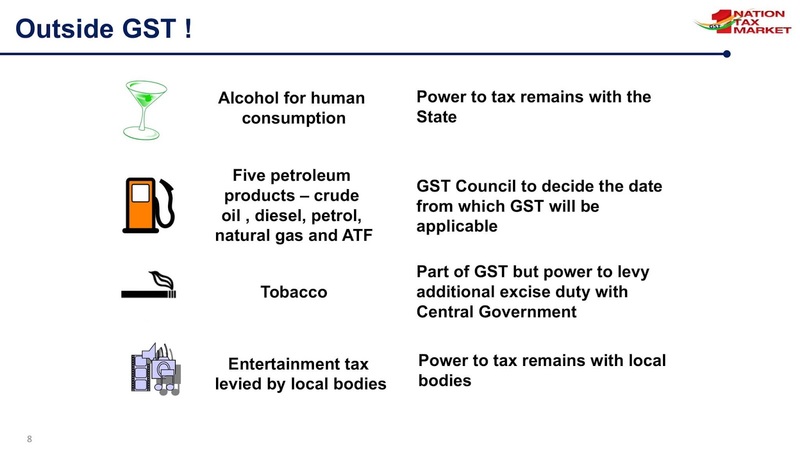 Power to tax remains with the State. Power to tax remains with local bodies. The government may convert existing Area-based exemption schemes into reimbursement based scheme – Already notified by Centre on 05.10.2017. > taxpayers having the turnover above Rs. 1.5 cr. 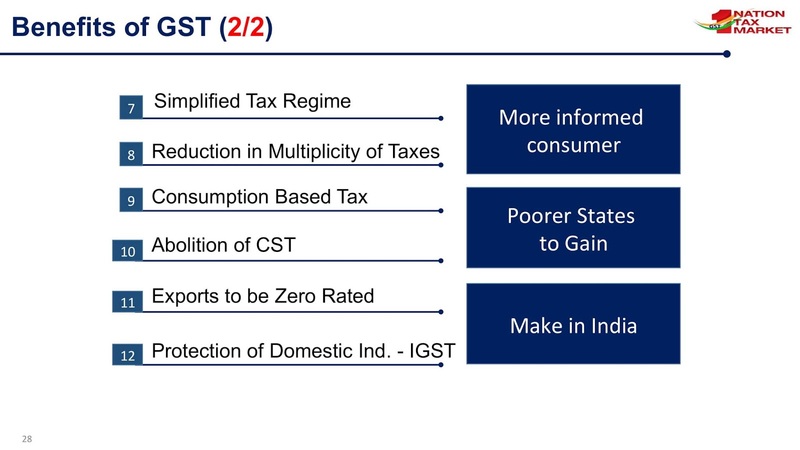 would be divided equally between Central and State tax administration. Eighteen rules on composition, registration, valuation, input tax credit etc.have been recommended and notified. > whose tax liability for that month was not ‘NIL’ will be Rs. 50/- per day instead of Rs. 200/- per day. An upper limit of turnover for opting for composition scheme to be raised from Rs. 1 crore to Rs. 1.5 crore. Present limit of turnover can now be raised on the recommendations of the Council. Threshold exemption limit for registration in the States of Assam, Arunachal Pradesh, Himachal Pradesh, Meghalaya, Sikkim and Uttarakhand to be increased to Rs. 20 Lakhs from Rs. 10 Lakhs. Amount of pre-deposit payable for the filing of appeal before the Appellate Authority and the Appellate Tribunal to be capped at Rs. 25 Crores and Rs. 50 Crores respectively. Commissioner to be empowered to extend the time limit for return of inputs and capital sent on job work, up to a period of one year and two years, respectively. The order of cross-utilisation of input tax credit is being rationalized. 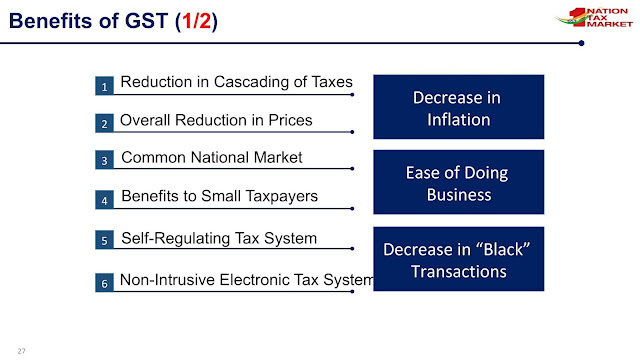 All taxpayers excluding small taxpayers and a few exceptions like ISD etc. shall file one monthly return. The return is simple with two main tables. One for reporting outward supplies and one for availing input tax credit based on invoices uploaded by the supplier. Invoices can be uploaded continuously by the seller and can be continuously viewed and locked by the buyer for availing input tax credit. This process would ensure that a very large part of the return is automatically filled based on the invoices uploaded by the buyer and the seller. 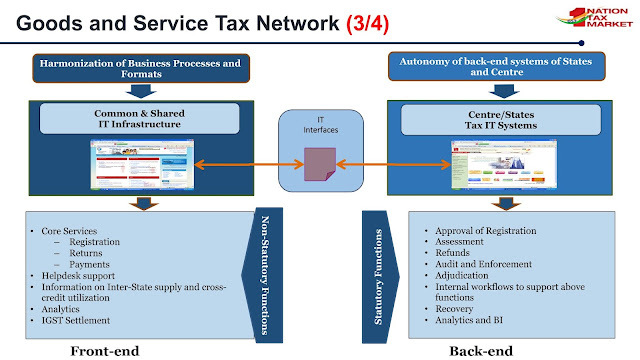 Simply put, the process would be “UPLOAD – LOCK – PAY” for most tax payers. There shall be the quarterly filing of return for the small taxpayers having turnover below Rs. 5 Cr as an optional facility. Quarterly return shall be similar to main return with monthly payment facility but for two kinds of registered persons – small traders making only B2C supply or making B2B + B2C supply. For such taxpayers, simplified returns have been designed called Sahaj and Sugam. In these returns details of information required to be filled is lesser than that in the regular return. The new return design provides the facility for amendment of an invoice and also other details filed in the return. An amendment shall be carried out by the filing of a return called amendment return. Payment would be allowed to be made through the amendment return as it will help save interest liability for the taxpayers. 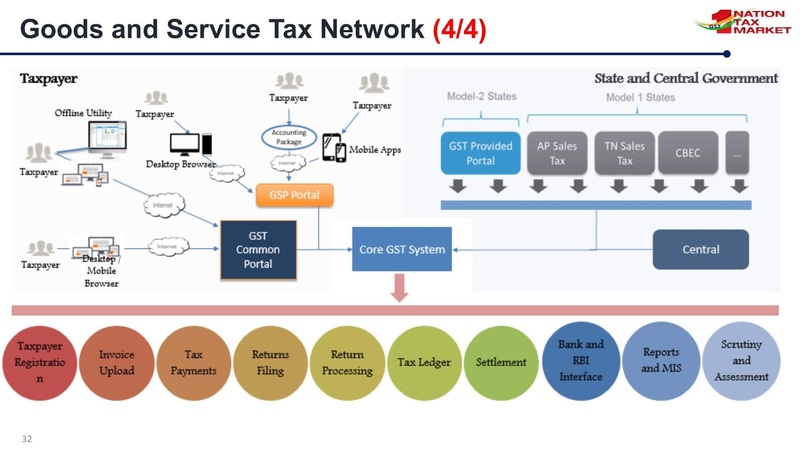 GSTN and GST Suvidha Providers (GSPs) to provide technology-based assistance. Provisional release of 90% refund to exporters within 7 days.